VE4MER is now operating at 442.575 MHz, with a positive offset at 50 Watts. The repeater is utilizing the a DCS Tone of 432. Ensure you TX this tone, or you will not be heard. This change was required due to interference from a transmitter on a nearby frequency. In addition to the frequency change, I've also added an additional bandpass and reject cavity on the receiver. This has so far eliminated our problems. I have also swapped the Yaesu Fusion DR-1X for a Motorola MTR 2000 repeater. The repeater is strickly in Analog service now. 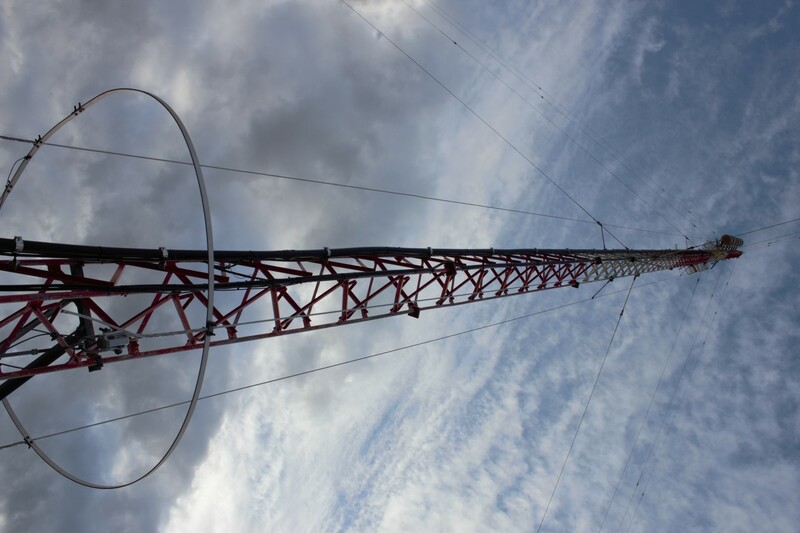 On October 20th 2015, Gord (VE4GLS) and Darcy (VE4DDW) installed the VE4MER repeater at the new tower site just north of St Pierre-Jolys. 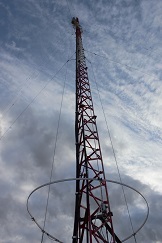 The riggers from Golden West did a stellar job of installing the 4 Bay dipole, and 5 GHz point to point radio. 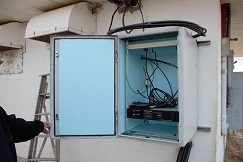 With the antenna installed we were able to mount the enclosure to the back of the building. The tower is RF Hot, so working nearby requires careful consideration before touching things! 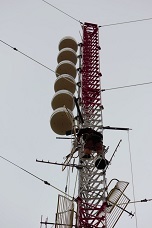 Beside the FM broadcast antenna on this tower, the tower iteself is within the RF field of the AM transmitter antenna array used at the site. While running power outside, the Golden West staff advised us that the entire building is on generator power, meaning VE4MER has automatic backup power! Immediate testing showed that the receiver was very easily overloaded. Based on this, we just tightened the squelch, and decided to run it for a few days on low power (5 watts into the duplexer). After more testing, reports indicated that RX performance was even more comprimised than we originally had thought. We were then on a hunt for better filtering. After much discussion, Gord (VE4GLS) suggested we try swapping the RX/TX frequencies and see if there was any improvement. Our believe is that the desense was primarily due to co-located transmitter, and NOT our own. This would prove to be a critical test. Upon making this change, RX performance dramatically improved, proving our theory correct. After speaking with Golden West Broadcasting I discovered their commercial UHF transmitter is less than 1 MHz away from VE4MER receive frequency. The temporary solution is to keep the reverse repeater pair until adequate filtering can be found. Though we may have to make the frequency change permanent. Recent testing shows mobile coverage throughout Winnipeg. HT coverage full quieting in south St Vital. Check out the installation slideshow below! 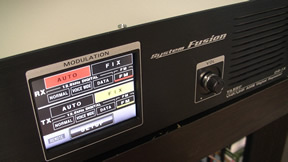 I have recently taken delivery of a brand new Yaesu Fusion DR-1X Repeater. This is a dual-band digital (C4FM) & analog (FM) repeater, capable of 50W output. I have been testing the repeater on the existing frequency of 444.725+, from my house utilizing a Comet vertical antenna at 55'. Using the existing mobile duplexer, performance has been excellent with coverage to the south perimeter highway, and as far NE as Ross MB on mobile. 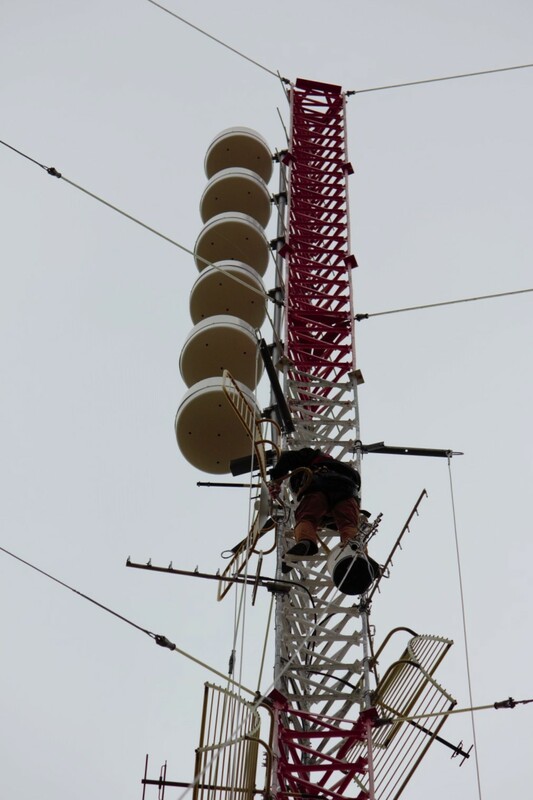 I have been actively searching for a permanent home for the repeater, ideally somewhere just south of the city and accessible 24/7 for maintenance. All of this work has finally paid off, with Golden West Radio graciously donating tower space for the club. The tower at Golden West is located along Hwy 59, approx 10km north of St. Pierre-Jolys. Our mounting height will be approximately 150ft AGL. Golden West has allowed us use of power at their site, at no cost. In addition, by having our own cabinet will be allowed 24/7 access to the repeater for maintenance.